Now, I do not wish in any way to suggest a similarity between the work of Fontana or that of Ferruccio…Ascari, if for no other reason than that they are each engaged in exploring a completely different area, using different means to different ends. Nevertheless it was this image which came to mind when I visited Ascari ‘s studio to view his recent works: la main volante. Not because of any formal similarity, as I have said: Ascari ‘s works are not the nervous emanations of a feverish creativity, they make no allusions to immateriality; they are themselves material compositions – it is just that they appear to evoke a material and a universe which is, rather felicitously, alien. They haver outside time and partake of the timelessness of symbol. I n fact, they invite the viewer to make an attempt at deciphering – an attempt which, it is clear from the start, cannot he definitive. Neither does the act of painting itself, which here we regard as central, transcend the material basis which is its integral constituent. The affinity which I have discerned lies, of course, in the attitude of each artist to his work. In Fontana’s cutting strokes, actions intended to evoke the idea of an absolute, there is no expressive subject: there is merely an “otherness” which exhihits itself. The subject facilitates this process, mediates in its mergence. Ascari ‘s approach is not dissimilar; in his case the artist “steps aside”, so to speak, and allows the form to he revealed. The role of the artist lies in his approach – the preeminence of the mental act which characterises all contemporary art. Here we have an ancient technique, that of fresco, immediately combined with a related technique of conservation: the lifting away of the image on another support. 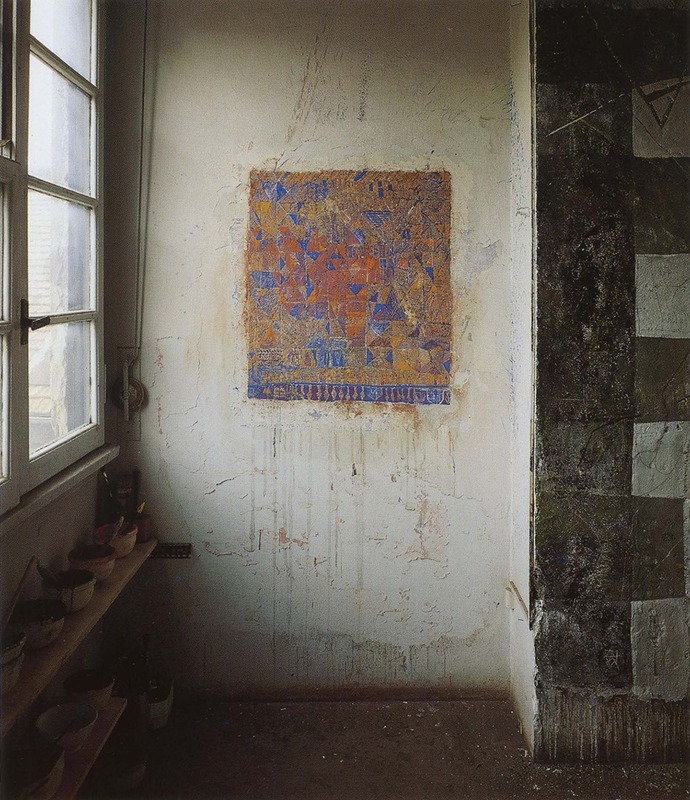 The artist has made both techniques his own: on the wall of the studio he prepares the surface upon which he applies the paint in the traditional fresco manner The lifting away of the image is in a certain sense the validation of the work, since without this stage it is not complete. In this way the technical procedure becomes the theme of the work which is thus an expression of its own procedurality, a specific act in a specific time using techniques drawn from tradition and subjected to continual renewal. The colours, the forms, the chance effects which the technique involves, all of the elements of the resulting work contribute to its sense in the same way; there is no hierarchy and sense is a possibility. The work is not the index of a presence or even of an absence because everything derives from the intention, the calibration of the relationships between the various linguistic elements and between these and their material “matrix” – the technique itself. The artist “steps aside” and allows the elements to speak for themselves, merely providing the means for their emergence. He is present as a mediator of the language, absent as redundant subject. He does not “express himself’; he maintains a critical distance from the “self expression” which has characterised much recent art and of which he has never been a close adherent. Another procedural element is afforded by those paintings which incorporate metallic surfaces. In this case the composition is constructed using calibrated assemblages of heterogeneons materials, both traditional and modern, artistic and non-artistic. The approach exploits eurhythmic principles which in the case of Burri, and later many others, consist in creating harmony from discordant elements and the conferring of a “precious”, academic quality on the work. Canvas and metal are juxtaposed as materials which, while not entirely foreign, are not completely assimilable: they lie side by side, exchanging mutuality and testifying to their dfferences. The pictorial field is disputed by two closely-matched presences: one rational, legible, in the regular pattern of the surface, a constructive intention discernible as a trace, an imprint, an echo a signal; the other irrational, which allows a glimpse, so to speak, of the unconscious, the phenomenological autonomy of matter. The metallic surfaces bear signs of wear and other characteristics of their material nature. The painted surfaces embrace all significant elements, from the intentional to the accidental, in a manner which Boetti would call “‘unconcerned”: everything included in the surface has the same textual status; what is not included is not a problem. The work therefore intends itself as complete – it is not the mere record of an activity. Nevertheless, the artist comes after: his preparation lies behind what we see. What stands before us depends also on us, the sense which we may or may not want to invest in the work which is, in any case, projected into the territory of the possible. How else could this process he descrihed if not as the work of the “main volante”? View of the artist’s studio. A finished fresco is visible in the centre, while on the right is a work in progress. The artist paints directly onto the wall, subsequently lifting off the image onto a canvas support. Here it is elaborated using metal oxides and iron sheet using the procedure which has produced the works of the last few years.